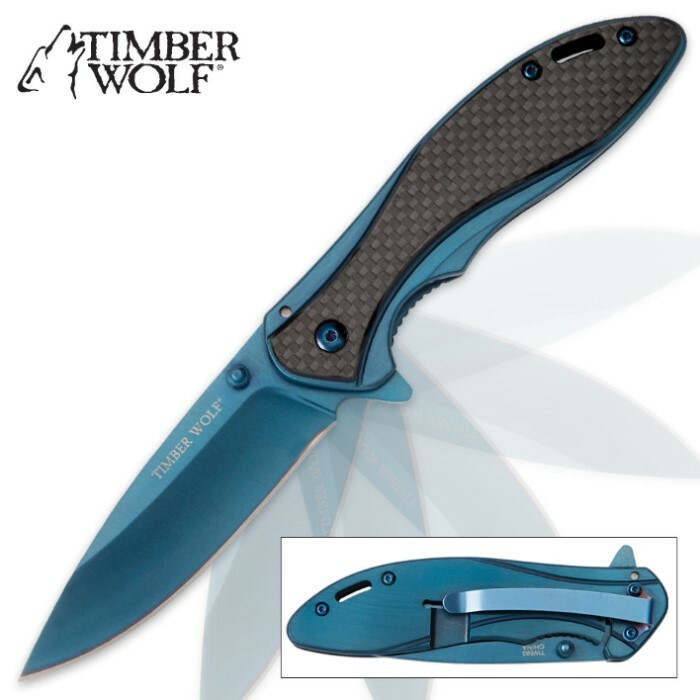 Timber Wolf Blue Titanium Pocket Knife | BUDK.com - Knives & Swords At The Lowest Prices! The Timber Wolf Blue Titanium Pocket Knife has an overall electric look that makes it a stand-out knife for your collection! The 3 1/4” stainless steel blade is razor-sharp and can be deployed quickly using the flipper or thumbstud to engage the assisted opening mechanism. 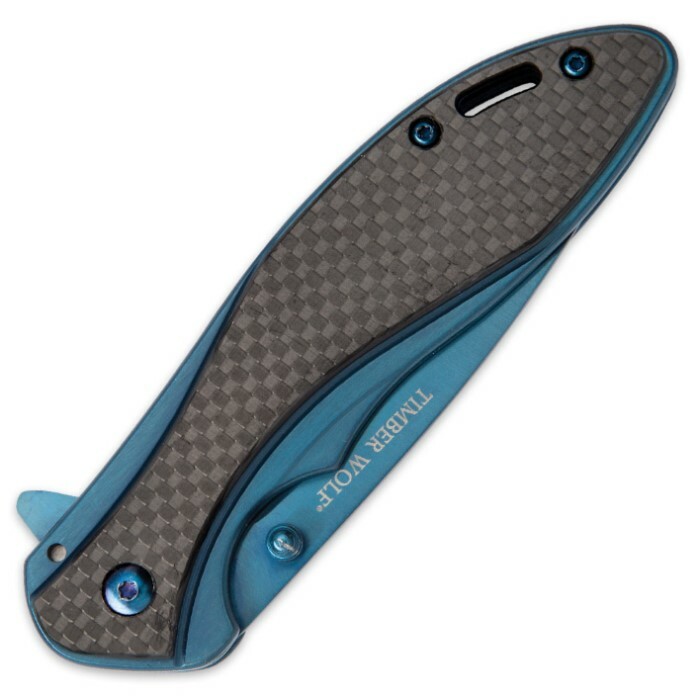 Both blade and handle are blue titanium electroplated for a brilliant finish and a black carbon fiber insert complements the overall look of the pocket knife. 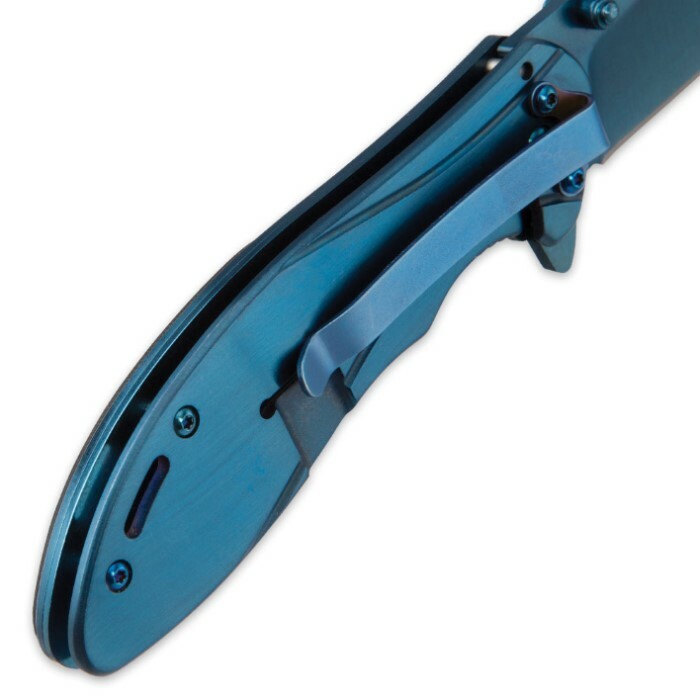 A blue titanium electroplated pocket clip lets you carry this pocket knife with ease. Good looking knife with a shiny finish. This one came sharp out of the box and the flipper works better than the thumbstuds. The assist is a little stiff but I prefer it that way. This blade has a strong lock in the handle and it fits comfortably in the hand. This is one of my more favorite EDC's when I bought it on sale a few weeks ago. Good solid knife and you won't cry if you break it because it's cheaply replaced. First of all, this is a nice looking and wicked fast opening knife. Mine arrived last week and I tested each of them before I gifted several of them friends. These open quickly and securely lock in place. Good looking piece. The blue looks really sharp on this knife. My only suggestion would be to have the carbon fiber on both sides of the handle. Still a great looking and operating knife that won't disappoint. FYI, these are razor sharp right out of the box. I did not see any burrs on mine from a rush job. Well done. I love the color, the stability, everything about it. Another great Timber Wolf build! The only problem is that I am a lady and lady's jeans pockets are a joke. Have to move it from EDC to the BOB until I have more than 1 pair of work pants where it will actually stay in the pocket. Still, that's a me problem. The dimensions are listed in the description. It's only a matter of time before I go back to carrying and using this wonderful knife every day! Love this knife well made for the price. Timber wolf has done it again!